Thanks to donations from generous people like you, Bailey-Boushay House provides food bags to help clients cope with end-of-month food scarcity. 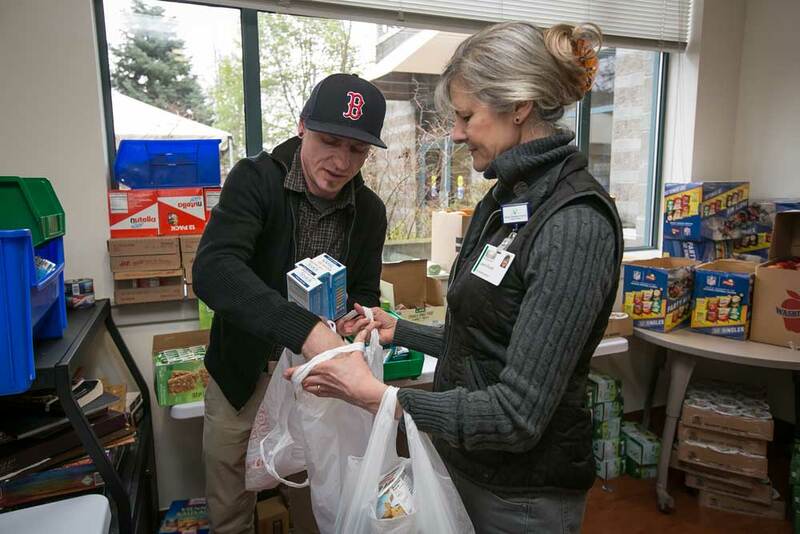 On the day after Christmas, 91 Bailey-Boushay House clients went food shopping — without even leaving the building. Right down the hall from the Big Room where they gather every day, each client picked out enough free food to fill two grocery bags. Another shopping event happened on Jan. 26, with the next one planned for the last week of February. 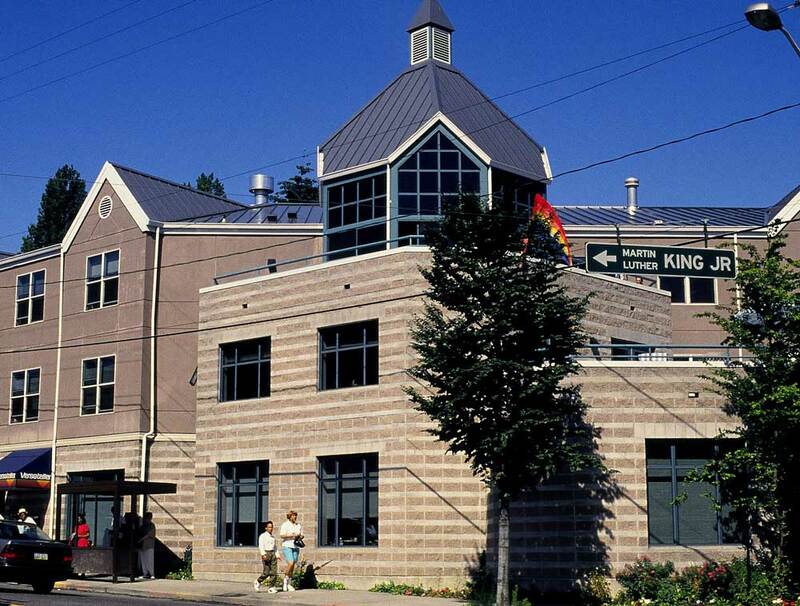 Half of Bailey-Boushay clients face homelessness — in addition to the challenges of living with HIV/AIDS, mental health issues, and chemical dependency. In 2016, 80 percent of new clients had no permanent housing. Clients get a hot breakfast, lunch, and take-away snack at Bailey-Boushay every day. But they’re on their own from 4 p.m. to 6:30 a.m.
Cans need openers. Fresh produce soon spoils. Nutritious lentils, beans, and pasta require a pot, clean water and a burner or microwave. A cooking staple like tomato sauce isn’t pleasant to eat cold from the can. “Our goal is to reduce hunger,” says Brian. Also, many client medications must be taken with food, increasing the urgency for regular meals. Access to food that’s shelf stable and ready-to-eat increases the chances of life-saving medication being taken successfully. “We started by asking clients what they need and want,” he says. At community meetings, client suggestions led to a better food plan. While all clients can get food bags, not all the food accommodates the needs of the homeless. Cans with pop-tops are easier to use. Single servings eliminate spoilage. And things that taste good cold work better for more people. “We even tried stuff beforehand [in a community meeting] and chose what we would like,” says Glenda, a longtime client who was formerly homeless. Turns out canned chili and clam chowder taste good cold, but tomato soup doesn’t. When people have lived with food insecurity for any length of time, they experience deep anxiety that can stay with them for years — even if they have food available. Throughout the first day volunteers Alisa B. and Danny K. restocked eight stations organized by food groups. At the protein station, for example, clients could mix and match up to four items: plain tuna, packets of prepared tuna with crackers, Vienna sausages, Nutella and breadsticks, and peanut butter cups. The two most popular food choices were canned chili and Pringles. One non-food item was also a favorite: a roll of high quality toilet paper. Helping individual clients decide how many of each food group they wanted was rewarding to the volunteers. For Alisa it was an “exciting experiment” to be in on for the first time. “I love how Bailey-Boushay listens to client needs and comes up with creative ways to meet those needs,” she says. She’s also impressed by the efficiency and immediate impact of the food bag experiment. 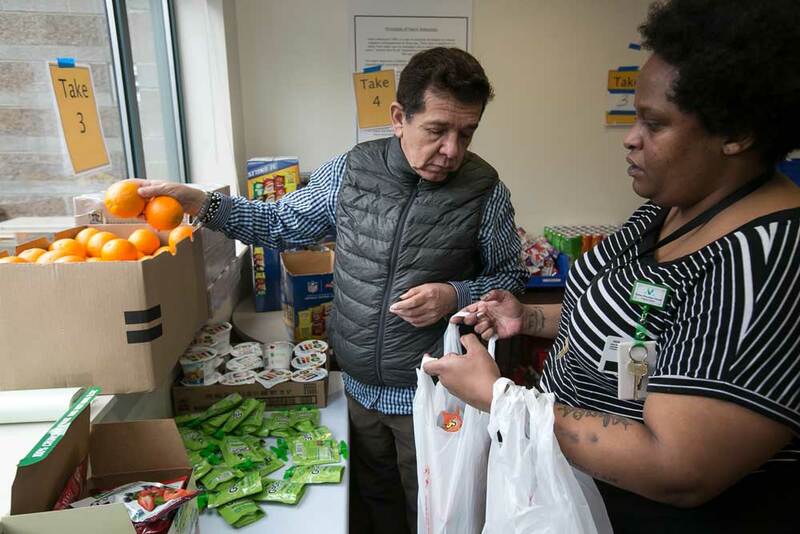 The food bag program at Bailey-Boushay — and a recently opened clothes bank — aren’t permanent programs at this time. They are pilot programs, made possible by donations to the Bailey-Boushay Homelessness Fund. 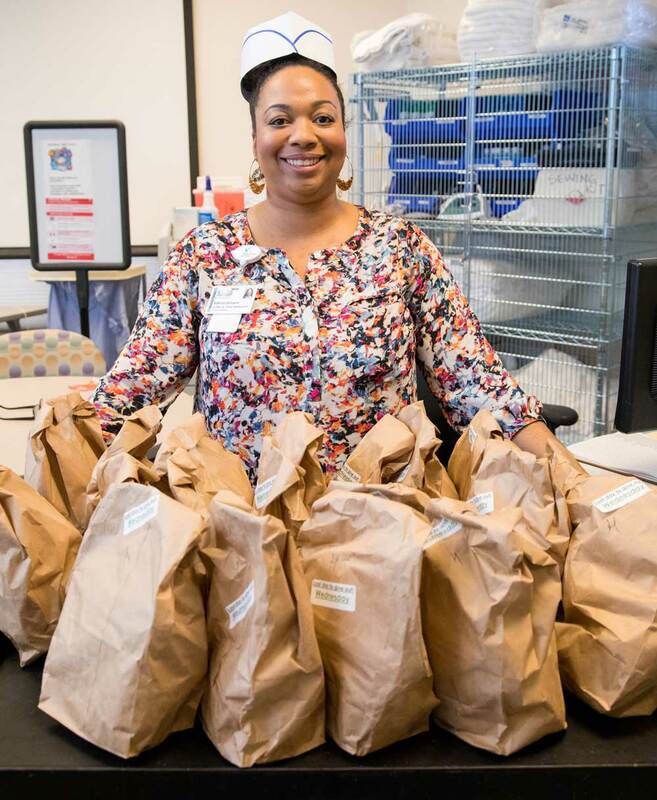 Judging by early reactions of clients to the experiment — which ranged from delight (“Wow, great stuff!”) to gratitude (“a life-saver”) — food bags at Bailey-Boushay have already made an impact.